Limited-Edition Cassette Tape Out Now! The Limited-Edition tape features 3 tracks: besides Brooklyn and White Horses, it includes Badlands – an exclusive recording that won’t be available in any other format. Badlands is a mixture of poetry and Link Wray-esque guitars, inspired by the 1970’s film of the same name. Originally, the band intended to sell the tape at gigs only, but because we have been unable to play gigs for while it’s now available online! Each tape is an unique, handmade and numbered item. Available while stocks last. This entry was posted in NEWS and tagged badlands, brooklyn, cassette tape, cassette tape single, Dirtblonde, indie rock, limited-edition single, white horses. Bookmark the permalink. Fire at Korova, Hope st. Liverpool! 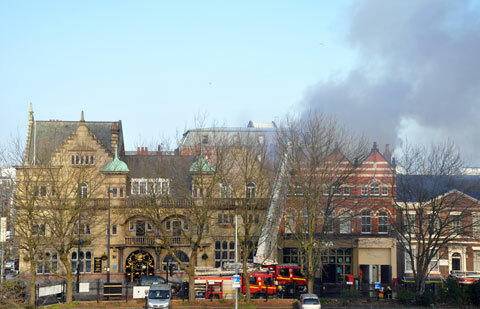 We woke up this morning to the news that Korova on Hope St. Liverpool, was burning down from a big fire that started early today! Dirtblonde are a bit distressed because we were supposed to have played at Korova the night before but had to cancel the gig due to illness, and left our amps there so the other band could use them. Now we’re worried that they’ve been damaged by the fire…especially upsetting for Ivan, whose customized, vintage Vox Ac30 was quite unique and pretty much irreplaceable! We’re gutted. Of course, a shame about the venue, too…the Liverpool music scene will miss it, and we will, too – after all, Dirtblonde were involved with Korova from the beginning, when Ladytron invited us to host one of the first regular club nights (which we called ‘F*CK’) at the original venue when it opened. But bad news aside, online single Brooklyn / White Horses will be out this Monday. We’ll sell the limited-edition cassette tape here on our site, soon. This entry was posted in NEWS and tagged brooklyn, Dirtblonde, fire at korova in Liverpool, hope street, korova, liverpool, Liverpool Music Scene, NEWS, single. Bookmark the permalink. It’ll be released as a free download on the 19th April, but for those of you who want something you can actually hold, you can pre-order the limited-edition cassette tape now, which we’ll mostly just sell at gigs. Just email us and we’ll send you the payment info. It’ll cost £3 including postage. The cassette will also include an exclusive track, Badlands. On another news, it’s good to see that some people are already writing about it, such as the music blog for cool Manchester rock’n’roll clothing brand Dead Legacy, who mentioned our re-release of The Hangmen and also Brooklyn. Thanks, guys! This entry was posted in NEWS and tagged brooklyn, dead legacy, Dirt Blonde, Dirtblonde, liverpool, Liverpool band, Liverpool Music, manchester, new indie rock single, rock'n'roll clothing brand, white horses. Bookmark the permalink. New Dirtblonde song! Listen to ‘White Horses’ now! 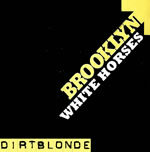 White Horses will be available for FREE download on 19th April, as an online single alongside other newie, Brooklyn. This song is one of our loudest, most brutal tracks yet – kinda like a full-on punk My Bloody Valentine. When we played it at Liverpool Music Week last year (supporting Bombay Bicycle Club) the audience was left literally speechless! Guess people are not used to some good rock’n’roll noise anymore…well, you’d better get used to it! This entry was posted in NEWS and tagged alternative music, alternative rock, brooklyn, Dirt Blonde, Dirtblonde, free download, indie rock, liek my bloody valentine, like sonic youth, liverpool, Liverpool band, Liverpool Music, Liverpool Music Week, loud guitars, online single, rock'n'roll, sxsw artist, SXSW band, white horses. Bookmark the permalink. Back due to popular demand! ‘The Hangmen’ 3-track download single! 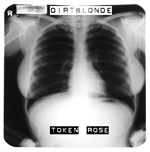 Dirtblonde’s critically acclaimed 2005 free download single is now available again, due to popular demand! Download The Hangmen 3-track single now! ‘The Hangmen’ was recorded on one hazy night, back in 2004, in a recording studio in Leicester, of all places. 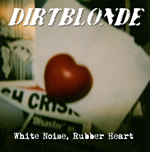 Released early 2005 when Dirtblonde returned from a tour in Brazil, ‘The Hangmen’ instantly became Dirtblonde’s key track, and was played on XFM, BBC Radio One and BBC Radio 6, being called “one of the loudest records of the year so far” by John Kennedy (XFM). Other legendary DJs who also played the single include Steve Lamacq and Nic Harcourt of KCRW in California. Alan McGee of Creation Records fame, also played ‘The Hangmen’ on his BBC radio show, and compared Dirtblonde to The Jesus And Mary Chain. Dirtblonde will release a new, double A side online single on 19th April 2010, featuring new songs ‘Brooklyn’ and ‘White Horses’. The single will also be available on a limited-edition cassette tape format, with exclusive extra songs. “Dirtblonde are playing a white-noise punk rock sound that is innovative, spikey and (as their name suggests) incredibly dirty. Following their rather public split from their record company, the band’s been receiving plenty of attention and it’s easy to see why. “There are a couple of cornerstones to the potential success of this particular record. The first of these has to be the punk-style controversy inspired publicity that can’t do anything but help the reputation of a band such as this. “Second is the intense guitar style of Ivan Hell which will be familiar to Drugstore fans, but for everyone else, involves an overdriven mid-range throaty noise that sounds like it’s ripping the speakers in half. “The third key element is the combined bass guitar and vocal style of Lula Blue, who sounds like a cross between Deborah Harry and Wendy James after an overdose. “Finally, there is a decent collection of material, with ‘The Hangmen’ being the better recording of the three and also probably the better song with Dee Dee the drum machine kicking out a respectable beat while the bass lends reality to the surreal guitar sounds. All this is topped off with a hooky riff and crazy blurred verse and chorus mix. “‘Superfan’ and ‘I’m Tired’ are even grittier demo recordings that capture a muffled indication of what ‘The Hangman’ belts out. “If you took all the deranged and distorted parts out of this recording, you’d be left with complete silence. However, despite the insanity of it all, the end result is as satisfying as it gets. This entry was posted in NEWS and tagged Alan McGee, BBC Radio 6, BBC Radio One, BP Fallon, brooklyn, Creation Records, Death Disco, Death Disco NYC band, Dirtblonde, indie rock, John Kennedy (XFM), KCRW, Liverpool band, Liverpool Music, Liverpool Sound City, lo-fi rock, new lo-fi single, Nic Harcourt, one of the loudest records of the year so far, scuzzy rock, South By Southwest, south by southwest band, Steve Lamacq, SXSW, SXSW band, the hangmen, the Jesus And Mary Chain, The Stool Pigeon. Bookmark the permalink.